﻿ Emergency Release Coupling ERC | KLAW uses a collar release mechanism. The KLAW ERC is the breakpoint within a transfer system and is designed to minimise risk to assets, personnel, reputation and the environment. KLAW Emergency Release Couplings (ERC) and Emergency Release Systems (ERS) minimise risk of spills by closing both downstream and upstream flows of media within the Hose or Loading Arm transfer system. When an event occurs, Flip-Flap Valves close and the Emergency Release Coupling separates. These couplings therefore minimise risk to assets and the environment and help protect personnel from injury. Clean-up costs and down-time are also greatly reduced. The KLAW Emergency Release Coupling is an alternative to Breakstud Release Couplings and instead uses the KLAW Collar Release Mechanism. This release mechanism offers manual control options and an automated system that does not rely on any tensile load on the transfer system to activate. This enables control over the release of the coupling for a pre-determined situation or operational condition. The ERC therefore allows less stress on associated hoses and pipework compared to the Breakaway Coupling (BAC) option. 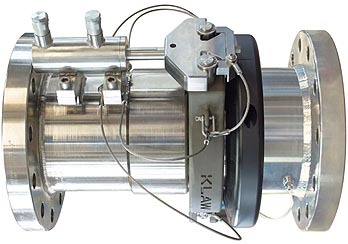 The KLAW Emergency Release Coupling provides a range of control options and system designs. KLAW can offer various ERC specifications to suit your operational requirements: Cable Release, Hydraulic with HPU Control Unit, Manual Hand-pump, Dual Emergency Release and Spring Retained. Loading Arm operations and Tank Storage facilities are susceptible to drive-off by loading or supply vehicles such as trucks or rail cars. The KLAW Emergency Release Coupling and Breakstud Breakaway Coupling (BAC) range offers protection against the consequences of an unprotected Loading Arm system when a drive-off event occurs. Loading Arm and hose transfers during any operation are at risk of drive off or vessel movement during both loading and unloading operations. This can be caused by failure to unhook the connection post transfer or from unwanted movement during the operation. The KLAW Emergency Release Coupling (ERC) and standard Breakaway Coupling (BAC) offers protection against the consequences of these events and avoids potential damage to loading arms or transfer equipment. KLAW Emergency Release Couplings and Systems are available for both ambient and cryogenic applications. This means that KLAW can provide a safety solution for 99% of media transfers.